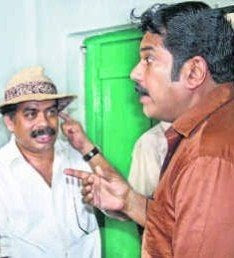 Its been Mukesh's long time dream to act in a Sathyan Anthikad's cinema.Both Sathyan sir and Mukesh were in the industry for more then 25 years,but they haven't worked together for many years..
Any issues between both ??? Not at all...Its just coincidence. 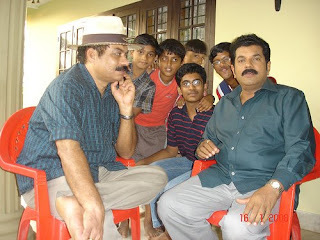 But when Sathyan sir saw this interview suddenly he called Mukesh and invited him for his very next project "Rasathanthram"..Followed by "Vinodayathra" and "Innathe Chinthavishayam". Mukesh's (Shaji Ragahavan )performance in Vinodayathra was simply superb...Sathyan sir also was impressed with Mukesh's acting. We hope they both will again work together in near future. MUKESH is one of the under-utilised actors in malayalam film industry.....hope they will team up in future too..What about Harisree Asokan and Salimkumar not in any Sathyan Sir's movies??? may be the reason what Mukesh said???? Mukesh is apt to become tensed quickly. Have u seen his kodeeswaran performance? 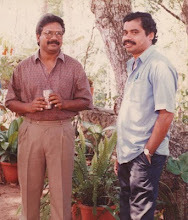 Just by comparison S Gopi found his true place as presenter. I am a great liker of Mukesh movies. But I have to tell my true impressions.